“William Jackson III may be the best pure cornerback available in the draft, and he is one of the few top players at the position who ticks all of the boxes for some teams when it comes to measurables and size as well as play. Last season he graded outstandingly well and he seems to have everything teams want in a top cover guy with room to get even better.” – Sam Monson, March 9, 2016. That was Pro Football Focus’ scouting report on a promising young cornerback named William Jackson III, which was published well before the Cincinnati Bengals selected him with the 24th overall pick of the 2016 NFL Draft. To say that scouting report is accurate would be an tremendous understatement, especially after Jackson’s historically great 2017 season, but back then, few would have anticipated the long and complicated road that he would need to take in order to establish himself as one of the NFL’s top cornerbacks. After being selected in the first round of the 2016 draft, Jackson III suffered a torn pectoral and was forced to miss the entire season. 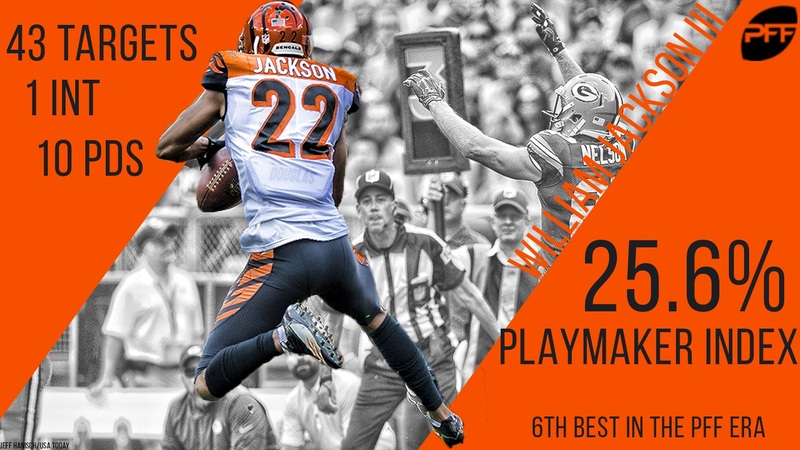 With his entire rookie campaign lost, Jackson’s first NFL action came in 2017, but for some reason the Bengals didn’t employ him as a full-time player, despite clear evidence he was the best coverage player in their secondary. Throughout the year, he logged just 698 snaps for the Bengals, with 327 of those snaps coming in the last five games of the season. Those 698 snaps trailed teammates Darqueze Dennard (899) and Dre Kirkpatrick (868), although Jackson clearly outperformed both of them. In fact, there is no better indicator of this than their PFF grades. Over the course of the year, Jackson attained an overall grade of 89.2 and a coverage grade of 88.9, both of which ranked eighth among 121 qualifying players at the position. In comparison, Dennard’s overall grade of 83.2 and his coverage grade of 81.9 ranked 31st and 37th, respectively, while Kirkpatrick’s overall grade of 56.4 and his coverage grade of 52.8 were good for 91st and 93rd. However, it’s not just his grades that tell the story. 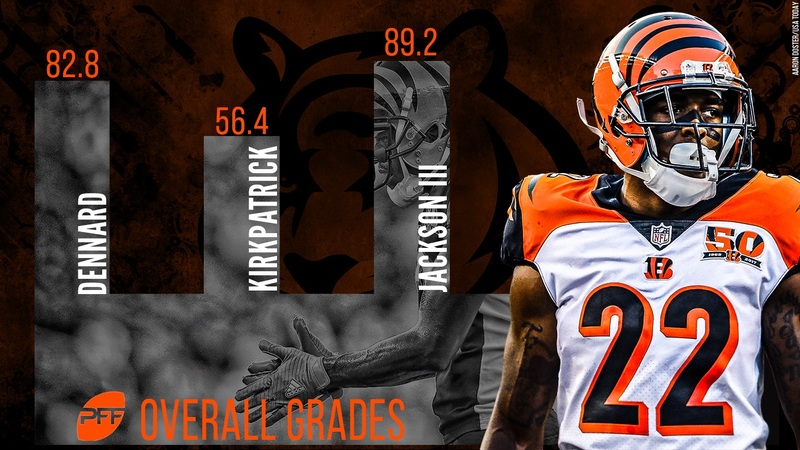 If you combine almost half a dozen advanced cornerback coverage metrics, you can not only prove that Jackson had the best year among Bengals cornerbacks, but you could make the case that Jackson III had one of, if not the greatest statistical season PFF has seen over the past 12 seasons for a cornerback. At Pro Football Focus, we have a wealth of signature stats at our disposal to show just how dominant Jackson was in 2017, but none are more impressive than the minuscule catch rate he allowed. Over the course of the season, Jackson was targeted 43 times in coverage but allowed just 15 of them to be caught – which equates to a catch rate of just 34.9 percent. That was the best catch rate by a considerable distance last season and beat the next closest player to him (Casey Hayward – 42.7 percent) by almost 10 percentage points. However, it wasn’t just the best mark among cornerbacks last year, it was the best mark that we’ve ever recorded in 12 years of grading, with the next best season performance being that of Darrelle Revis in 2009, when he allowed just 36.9 percent of the passes thrown his way to be caught. Maybe more impressively, however, is the fact that Jackson was targeted in every single game that he appeared in last year, yet he still managed to keep a completely clean slate in five of those games. Perfect games are rare, even for the NFL’s best cornerbacks, and Jackson’s five perfect games last year makes him just one of 10 cornerbacks to register at least five perfect games in a single season. 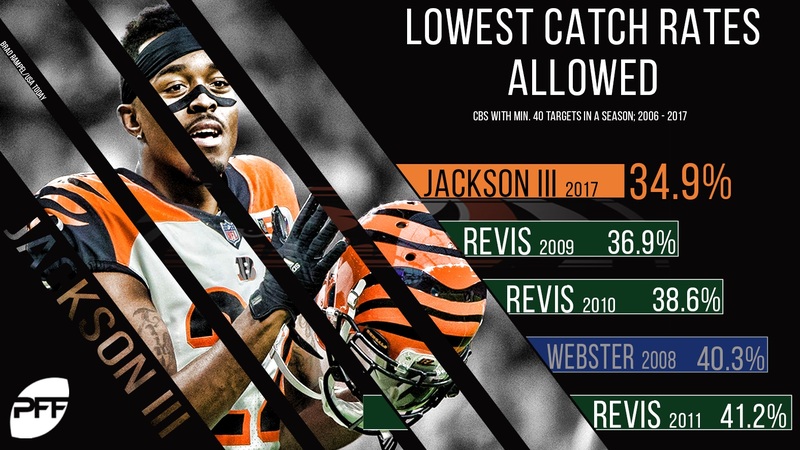 Jackson didn’t just allow a historically-low catch rate last year, he also yielded one of the lowest passer ratings that we’ve ever seen. Last season, Jackson allowed just 15 catches on 43 targets for a paltry 151 receiving yards, zero touchdowns and one interception – which resulted in a passer rating of just 36.1. To put that number into perspective, the passer rating for any incompletion in the NFL is 39.6, so statistically speaking, quarterbacks would have been better off throwing the ball straight into the ground every play than trying to target Jackson in coverage – that’s how good he was. Jackson’s mark of 36.1 was second only to A.J. Bouye (31.6) last year, and it’s the seventh-lowest mark ever recorded by a cornerback with at least 40 targets in a single season. In 12 years of grading, only 11 players at the position have ended a regular season allowing a passer rating lower than 39.6, and Jackson now takes his place among that formidable group that also contains Richard Sherman, Charles Woodson, Revis, Asante Samuel and Champ Bailey, who are some of the greatest players to ever play the position. Yards allowed per cover snap is another signature stat that demonstrates Jackson’s historically great season. It measures how much yardage a cornerback surrenders on a per coverage snap basis. Typically, yardage allowed per cover snap correlates very well to a player’s coverage grade, whether good or bad. Throughout the 2017 season, Jackson logged a total of 396 coverage snaps and allowed just 151 receiving yards, giving him an average of 0.38 yards allowed per coverage snap. 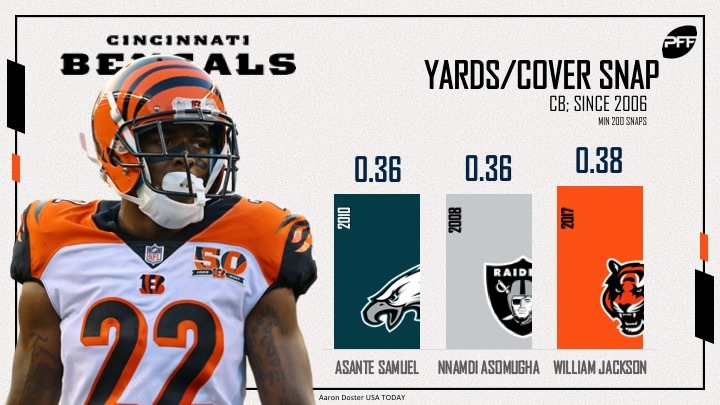 This not only ranked first among cornerbacks last year, it’s the second-lowest mark that we’ve seen in 12 years of grading, falling just short of the 0.36 yards allowed per coverage snap that both Samuel and Nnamdi Asomugha allowed in 2010 and 2008, respectively. This incredible number can be attributed to a dominant stretch over the Bengals’ final six games (Weeks 12-17), as Jackson allowed just 0.04 yards per snap he spent in coverage. That’s not just good – that’s the lowest mark ever recorded by a cornerback over the last six games of a season. 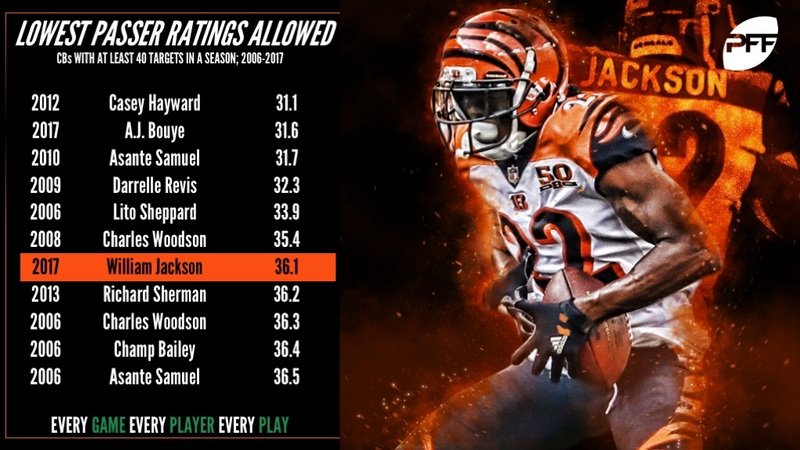 To further cement his place in the PFF history books, we can look at how many coverage snaps Jackson played per reception allowed, and the number that Jackson produced once again puts him right up there with the best of the best. On average, Jackson allowed a reception once every 26.4 coverage snaps, which once again not only ranked first among all cornerbacks in 2017, it was the third-best mark ever recorded by a player at the position. 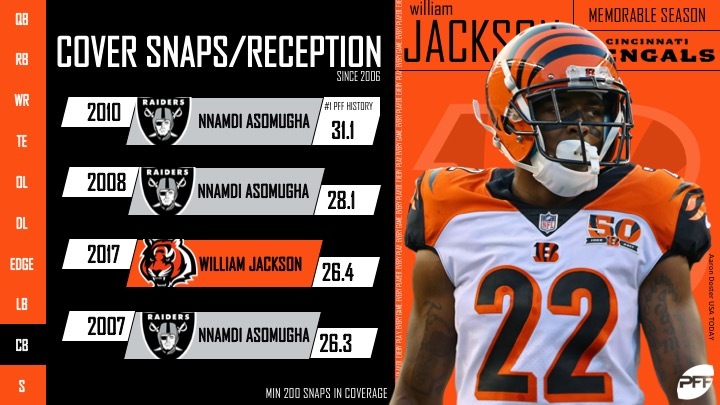 Over the last 12 regular seasons, only two cornerbacks have gone more than 25 snaps in coverage between receptions over a single season: Asomugha and Jackson III. When he wasn’t locking down receivers, Jackson was making plays on the football, and he did so at an astronomical rate. To go with his first professional interception, Jackson also ended the year with 10 pass-breakups next to his name, which was tied for the sixth-most in the NFL and something that’s made even more impressive when you consider the fact that Jackson was only targeted 43 times. When we look at all those targets, we can see that Jackson either logged a pass breakup or interception 25.6 percent of them, roughly one in four – which is astonishing. Once again, his playmaker index of 25.6 percent not only ranked first among all cornerbacks in 2017, it’s the sixth-best mark ever recorded by a player at the position. There’s no doubt about it, the road to being recognized as one of the best cornerbacks in the game has been a long and hard one for Jackson, but after such a good season, few should question his ability as a lockdown cornerback. With the 2018 season just around the corner, it’s going to be interesting to see if he can build upon the historic success that he found last year.